Lately I've been making a lot of side visits to the craft store. It always seems like I need another craft punch, or some more magnetic sheeting for my miniatures boxes. I do like to wander around in that store a bit, looking for inspiration. I have several future gaming projects in mind, one of which will be a post (and maybe a contest) all on its own, so I won't spoil it here today. When I go to this particular store I make sure I'm armed with a coupon or two. Usually there is a 40-50% off coupon for a single regular-priced item. If you are willing to make trips, you can save quite a bit. This store is just a stone's throw from the office supply store I get my paper model's printed up and less than a block away from the big-box electronics store I like to visit, so multiple stops into the store aren't an issue. 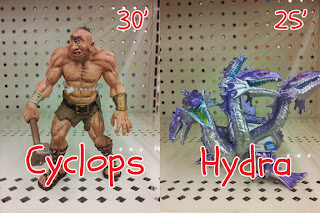 I casually mentioned the plastic toys in my last craft store visit post, but there were two that really "popped" for me on a recent visit. Now these figures cost about $20 a pieces, which is pretty high, but if they work for you and you get them for 40-50% off.....they aren't too bad. Now the giant cyclops is probably a bit large for many games (the height is a rough approximate), but the hydra is right in there...at least for a HackMaster game. It's just worth checking these figures out because you don't know what gems you may find. Even at $20 full price the figure might be a worthwhile deal when you factor in purchase price (plus shipping) of a traditional figure and all the time painting it. I'd probably go with a paper mini, but sometimes you really just want to plop down a cool figure. I can think of one particular convention game where the players faced off against a hydra. I'd have paid $20 just to see the look on their faces to lay this mini on the table as their adversary. That particular day at the store I was looking for mini bases and I already picked up some magnetic sheeting for a good price, but I was hoping for a cheap source of 1" wooden discs. I didn't find any, but I did come across a tool I will be adding to my GM toolbox (not proverbial, I actually have a dedicated GM toolbox). 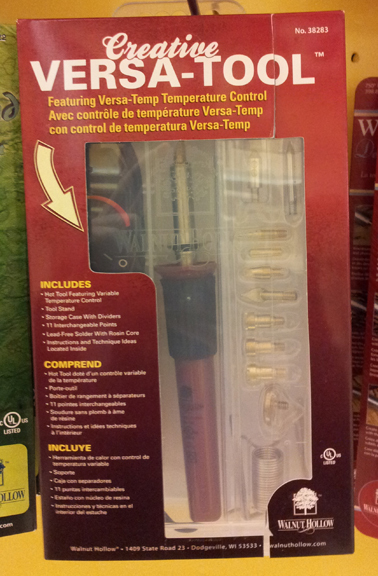 This versatile tool is essentially a soldering iron with a variable heating control and a bunch of specialized tips. I've hacked a soldering iron for use cutting Styrofoam for modeling, but I wanted something a bit more effective. Someone makes a series of foam cutting tools that are nice, but they are specialized for a single task and are crazy expensive. I figure with this tool and a dedicated large cutter (available in the floral foam section for about the same price) I should be good to go. I can also use this to cut & engrave plastic for templates, leather, and wood. The normal price is $30, but practically a steal with a 40-50% coupon. Of course this store has all the normal scissors, punched, papers, and glues.....everything you might need to spice up your home game.